DIY rocks. The Stone House Revival TV show has been renewed for a second season of 14 episodes, on DIY Network. Ellen’s Design Challenge alum Jeff Devlin hosts. The first season of Stone House Revival premiered in May. Get the details from this DIY press release. 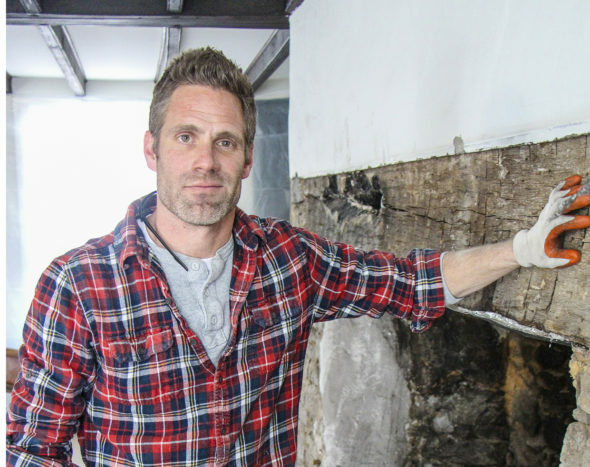 New York [For Immediate Release—August 30, 2016] DIY Network has ordered an additional 14 episodes of Stone House Revival, starring licensed contractor and carpenter Jeff Devlin. The series follows Jeff as he and his team of restoration experts work to renovate centuries-old properties in Bucks County, Penn. In each episode, Jeff refurbishes and transforms rustic homes into modern living spaces, while also preserving their historic integrity. More than 2.1 million viewers tuned in to the first season of the series. During its airing from Wednesday, May 11 to Wednesday, June 22 at 10 p.m. and 10:30 p.m. ET/PT, Stone House Revival garnered P25-54 ratings that were 14 percent higher than the year-ago and 13-week average. Jeff Devlin first gained acclaim on DIY Network’s I Hate My Bath. He also appeared in two seasons of Ellen’s Design Challenge on HGTV. DIY Network, from the creators of HGTV and Food Network, is the go-to destination for rip-up, knock-out home improvement television. Currently in more than 58 million homes, DIY Network’s programming covers a broad range of categories, including home improvement and landscaping. The network’s award-winning website, DIYNetwork.com, consistently ranks among America’s top home and garden Internet destinations for entertaining videos, home improvement advice, step-by-step instructions, message boards, blogs, an interactive program guide and more. Viewers can also become fans of DIY Network and interact with other home improvement enthusiasts and do-it-yourselfers through Instagram, Facebook, Pinterest and Twitter. Headquartered in Knoxville, Tenn., DIY Network is owned by Scripps Networks Interactive, Inc. (SNI). What do you think? Did you watch the first season of the Stone House Revival TV series? Do you plan to tune in for the second season premiere? More about: DIY TV shows: canceled or renewed?, Stone House Revival, Stone House Revival: canceled or renewed? Shame, Shame, Shame! Restore not renovate these beautiful hones from our history. Generations later will never know the beauty and how our ancestors lived. In Europe it’s always restore. How will our children ever understand the struggle? I love this show and look forward to its new season. Love love love Jeff. He just seems like the nicest guy. I’m so excited that stone house revival has been renewed. I want one of those old stone homes in pennsylvania. Just the greatest show. One of my favorites in the DIY category! So glad it will return for another season. The results that Jeff & his crew present to the owners are stunning… absolutely beautiful. And to help unearth & revitalize history? Doesn’t get any better. Thank you all for your care & craftsmanship. Wish we had some of those houses in Texas . Love this show and Jeff Devlin! I’m really happy that it has been renewed for a second season! Marvelous show, terrific host, all ’round entertaining. I LOVE this show, and can’t wait ’til it returns. Yay!!! So glad Season 2 is coming… definitely one of my favorite shows! I agree with the previous posters. This is a quality show, and I can’t wait for season 2. Congrats to Jeff Devlin and crew! I LOVE this show. Cant wait for the new season. When does it start? I like having a show that’s the same, but yet quite different. Keep up the good work! Love the show! From the area. So much more character in those old stone homes and properties. When will season two air? My husband and I watched all of season one and thoroughly enjoyed each show. I’m glad it is renewed. Really enjoy this show. Hope it has a long run.